Special design for Nintendo Swith Console. Protect your Nintendo Switch in our ultra slim stylish black portable carrying deluxe travel case, a great choice for traveler. Comes with a bag of fragrant bead particles and also a metal snap hook lobster claw clasp, you can use it to clasp on your bag, etc. Premium Sturdy EVA and PU leather. Hard shell material and soft microfiber interior PU leather protects Nintendo Switch from accidental bumps, scratches, and drops while in case. - Padded divider protects screen and zippered mesh pockets hold extra Game Cards. - Durable hard shell deluxe travel case holds and protects Nintendo Switch, a great choice for travellers. - 8 built-in game card cartridge holders allow you to take your favorite games on the go. - A high capacity mesh pocket provide storage room for small Nintendo accessories like charging cable, slim power bank, ear buds, and extra joy-cons. - Easy to carry by hand and keep your Nintendo Switch securely stored when travelling or when not in use. - Well-Protection: Secure your Nintendo Switch from shocks, scratches and dust. Ultra silm, add almost NO weight to your Nintendo Switch. -Swees® is a registered trademark and brand in United States and protected by US Trademark Law. -Swees® never authorizes any other third-party to sell our products, and please directly buy from offcial store sweesdirect to get the authentic products in guarantee and protect your own interest. 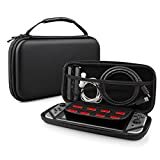 Black EVA hard shell protective deluxe travel case, specially designed for Nintendo Swith Console, protecting Nintendo Switch from accidental bumps, scratches, and drops. Designed with 2 oblique elastics to fasten, it helps us take out the Nintendo Switch easily and prevents it from colliding with other things while in the case. Handle design, easy to carry by hand and keep your Nintendo Switch securely stored when travelling or when not in use. No smell, comes with a bag of fragrant bead particles. One year warranty and unconditionally refund or resend with any quality problems, lifetime friendly customer service.